I am an oil painter and an art educator in Columbus, Ohio. My online gallery features contemporary oil paintings including landscapes, portraits and figurative artwork. My paintings are included in the permanent art collections of art museums, corporate art collectors, and private art collectors. Several paintings are in public art spaces. If you have any questions or comments regarding my artwork, feel free to contact me. My wife and business partner, Robin Anderson will post information on my upcoming art exhibitions as we finalize details. Robin updates the web site monthly with new images and information. She also handles the sale, licensing and exhibition of my paintings. 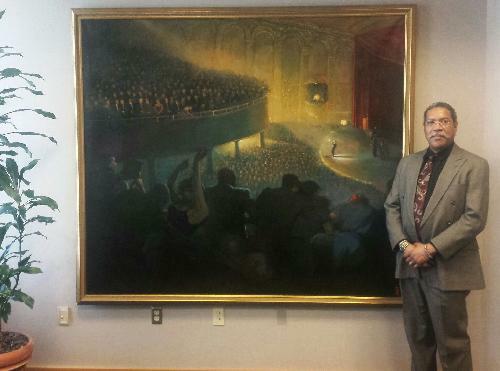 "A Point of Departure: Paintings by Ron Anderson"
"Concert in Blue" shown displayed in the Ohio Governor's office. Ron Anderson exhibited various paintings there from 2011 through 2019. 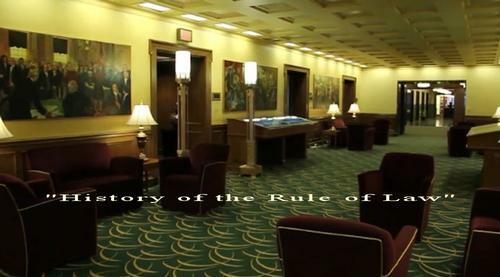 "The History of the Rule of Law" series of six paintings by Ron Anderson. In the Ohio Judicial Center permanent art collection. Information about the public art commissions I have completed are located here on my web site. I completed six oil paintings for the Supreme Court of Ohio depicting "The History of The Rule of Law", that are included in the permanent art collection of the Ohio State Bar Association. The artwork is on display on the 11th floor of the Ohio Judicial Center. Each painting measures 96" x 41.5" (wxh). I was also commissioned to create two portraits in oil of George Washington Williams. The paintings are included in the permanent art collection of the Ohio Statehouse in the George Washington Williams Memorial Room. Three of my oil paintings were added to the permanent art collection of The King Arts Complex , in an interactive installation entitled "Cargo: The Middle Passage". Another commission was for The Absolut Spirits Company: "Absolut Expressions" 3rd Annual Art Collection and Art Exhibit which included my oil painting "Absolut Anderson". The orginal oil painting is now displayed in a museum in Sweden. My oil painting "Popcorn and Peanuts" was selected by the Ohio Arts Council to be included in the Ohio Governor's Office Exhibition for a 24 month temporary loan through June 2013. A second painting "Concert in Blue" was chosen for a 24 month temporary loan through June 2015. "Kelly's Gym" and "Bottom of the 9th" were selected for an additional 24 month temporary loan through June 2017. "Concrete Village" was displayed through February 2019. Visit my web site at your convenience, and let me know if you have any questions for me about my work. One of my larger paintings is an oil on canvas entitled "9/11-9:11-911"
This was a very emotional and challenging piece to create after the events that unfolded at the World Trade Center in New York, on September 11, 2001. Another of my larger figurative oil paintings entitled "Shifty" is in the permanent art collection of the Elevator Brewery & Draught Haus in downtown Columbus, Ohio. Click this link to see Ron's oil painting "Shifty"
Contact Robin and I through our web site, or feel free to visit our online art dealer by clicking the link above to purchase my original oil paintings. This link takes you to my Premiere Portfolio on the Absolute Arts/World Wide Arts Resources web site. Their professional staff can work with you by phone or online to assist you in adding my paintings to your art collection. My Guest book and a sign-up form for my email list are also located on the Absolute Arts page. Artist owns all rights to copyright, and reproduction of his artwork as prescribed by the Copyright law of the United States of America. Images should not be reproduced without the explicit written permission of the artist. Buyer is responsible for all Shipping and Handling charges, and any applicable Sales Tax/Duties. Paintings are sold unframed.